The membranous bound and pigment containing bodies present in the cell are called plastids. Plastids were Discovered by Schimper in 1883. Plastids are present only in plant cells and some algae. Plastids are semi-autonomous bodies of cells. They contain their own DNA and ribosome. So, they are self-replicating organelles. The newly form plastid is called protoplastid. It then changes into etioplast. Etioplast grows to form complete plastids. The plastids are transferred to next generation through cytoplasm of egg. This plastid divide to form many new plastids. Plastids are absent in sperm. 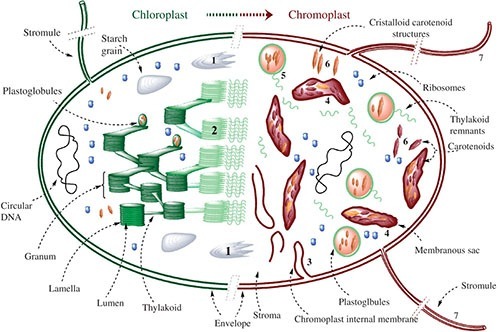 There are three types of plastids Chloroplasts chromoplast and leucoplast. The membrane bound structure, containing green pigment chlorophyll is called chloroplast. The chloroplasts are present only in photosynthetic plants and algae. They are present in leaves, green stems and un-ripened fruits. But they are present most abundantly in the mesophyll cells of leaves. There are about half a million chloroplasts per square millimeter of leaf surface. A typical mesophyll cell contains about 30 to 40 chloroplasts. According to one observation, leaf of Ricinus contains 400,000 chloroplasts per square centimeter. The size of chloroplast is 2 – 4 μm in width 4 – 7 μm in length. 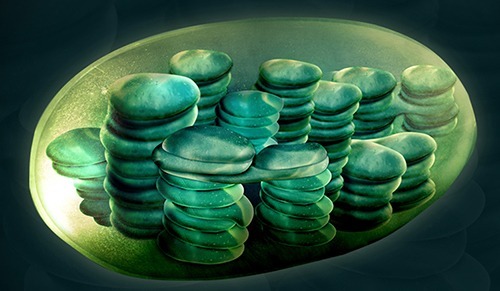 Chloroplasts are self-replicating organelles. The shape of chloroplast is different in different species of plants. Their shape may be spheroid, ovoid or discoid. Some chloroplasts are vesicle like. Starch grains are present in chloroplast. Light affects the distribution of chloroplasts in cell. Chloroplast concentrates towards the light source. The green pigment is an organic compound called chlorophyll. Chloroplast also contains carotenoids. It helps the plant to absorb light energy and manufacture food. The central atom of chlorophyll is Mg++. Chloroplasts are present in the form of protoplastids in cotyledon and primordium of stem. They are colorless at first. But they develop chlorophyll and becomes green. Chloroplast has different shapes and structures. Its diameter is about 4 – 6 μm. It appears heterogenous structure under light microscope. It has small granule like structure called Grana. These grana are embedded in the matrix. The chloroplast shows three main components under electron microscope. These are Envelop, Stroma, Thylakoid and Granum. The Envelop: the envelop is the outer covering of the chloroplast. It formed inner membrane extends inward, at some places, the inner membrane is in continuous with the thylakoids. This contact is used for transfer of material into and out of the chloroplast to cytosol. Inner membrane also contains small amounts of carotenoids. Stroma: Stroma is the fluid that surrounds the thylakoids. It covers most of the volume of the chloroplast. It is gel like substance. It contains about 50% of the chloroplast proteins. It contains proteins, some ribosomes and small circular DNA. Calvin Cycle or dark reaction takes place in stroma. The Carbon Dioxide is fixed and sugars are synthesized in stroma. Some proteins are also synthesized in this part. Thylakoid: These are flattened vesicles. 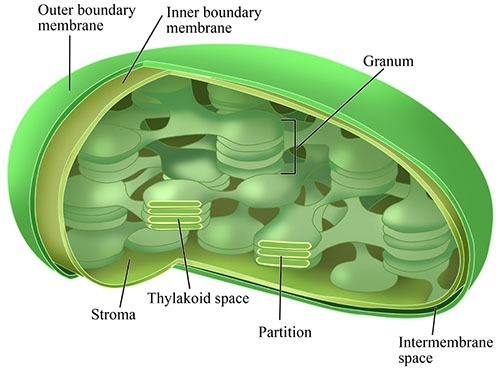 The outer surface of thylakoids is in contact with the stroma. Its inner surface encloses intra-thylakoid space. The number of thylakoid varies from 12 to 40. Thylakoids are membranous structure. Their membrane is composed of 50% of lipids and 50% of proteins. These lipids are mainly glycolipids, sulpholipids and phospholipids. The chlorophyll molecules are present in the form of clusters. They form photosystems. There are two types of photosystems: Photosystem I and Photosystem II. The electron carrier of the electron transport chain is present in the membrane of thylakoids. These electron carriers export H+ across the thylakoids. It creates H+ gradient. These protons come back through ATPase enzyme. It synthesizes ATP. Thylakoids are stacked to form grana and inter-grana. Granum: A granum is pile of thylakoids, stacked on each other like coins. On the average, 50 or more thylakoids are piled to form one granum. The light energy is trapped by the membranes of grana and ATP is synthesized. Inter-granum: The grana are interconnected with each other by the non-green part, called inter-granum. The plastids containing colored pigments other than chlorophyll are called chromoplast. Chromoplasts give color to plants other than green. Their shapes may be triangular or pyramidal or elliptical. They are present in the petals of flowers and in the ripened fruits. They are not actively involved in photosynthesis. They help in pollination and dispersal of seeds. They are themselves formed from chloroplast or leucoplast. The chloroplast of ripened fruit develops colored pigments and change into chromoplast. That is why the colors of ripened fruits changes from green to yellow, orange, red, etc. 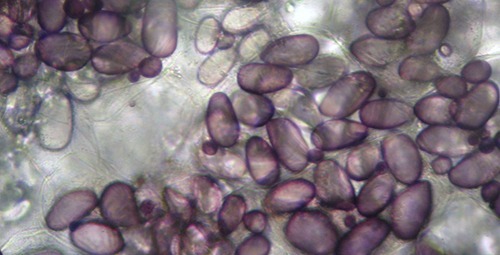 red pigment in chromoplast is lycopene. It is a member of carotenoids family. It is present in the ripened fruits of mangoes, tomatoes etc. the chromoplast of algae contains red pigment phycoerythrin and blue pigment phycocyanin. Amyloplasts: The starch storing leucoplasts are called amyloplasts. Aleuroplasts: Tshe protein storing leucoplasts are called aleuroplast. Lipoplast: The lipid storing leucoplasts are called lipoplast.